The running community on the Central Coast is like an extended family. We all share a common hobby and lifestyle, and spend a lot of time together. Many of us are close friends, and we all appreciate the different talents and personalities among our group. Sadly, the last few weeks have been tough ones for this local family of runners, as two of our members were forever taken from us. By now, nearly everyone in the area has heard about the senseless murder of Mel and Elizabeth Grimes in their Carmel Valley home, ostensibly over a boundary dispute and a large rock. The couple were prominent residents of the Monterey Peninsula, with a very diverse circle of friends. The running community took this news particularly hard, as Mel and Elizabeth were an integral part of the local running scene. They were both members of the Big Sur Marathon Board for many years. Mel’s main job was to head the committee in charge of the starting area. But on race day, he loved to run the marathon as well – a remarkably difficult combination of tasks. Mel would get no sleep before the race, as he would head down to Big Sur in the middle of the night to ensure that everything was set for the thousands of runners who would soon be arriving. He wore a race singlet and shorts under his clothes, and after overseeing a successful start of the race, he would tear off his blue sportcoat (worn by all Board members on race day), and chase the field towards the finish. He was the last to leave the start line each year, but usually passed most of the field on his way to one of his 15 Big Sur finishes. His wife Elizabeth also dedicated many hours to the marathon. Even after leaving her board position, she volunteered every year in the office during the weeks leading up to race day. She could be counted on to do whatever was necessary to help race weekend go smoothly. Elizabeth and Mel donated significant time and money to other local running causes. They were usually the first to donate and gave generously to the Wednesday Night Laundry Runners High School Scholarship fund, The Big Sur Distance Project, and Big Sur Marathon charities. Both of them were unpretentious, self-effacing, and a pure joy to be around – and our community will miss them terribly. Mel and Elizabeth will have a memorial service this Saturday, February 17th that will honor their many outdoor activities. The memorial starts at the Carmel Mission at 10:00 AM. Afterward, their ashes will be carried by runners to Carmel Beach (down the 11th Street stairs), and taken out to sea by the Outrigger Club. A Hawaiian surfing celebration will then take place as a way of paying last respects to the couple. The Grimeses obviously had many other friends besides runners, and anyone who wishes to join their memorial service is invited to attend. The lives of Mel and Elizabeth demonstrate a harsh reality for many runners. In most cases, life for endurance athletes seems quite fair. When we train hard, we reap successful results. If we dedicate ourselves to a goal, we usually attain it. If we stick to our training regimens, we feel like we control our own destinies. Because of our healthy lifestyles, many of us mistakenly feel immune to the everyday troubles of life. It’s only when tragedy strikes that we realize that life can be very random and unfair after all - sometimes in ways that make absolutely no sense. Mel’s participation in the Big Sur Marathon is an apt metaphor. He worked at the starting line for the benefit of others, then gave his best effort in running the race. Through the years, he ran many strong miles, but he could never have anticipated that his ultimate finish line would arrive quite so soon, or so tragically. As we mourn for Mel and Elizabeth, we’re more aware of just how arbitrary life can be, and reminded to make every mile of our own lives count. 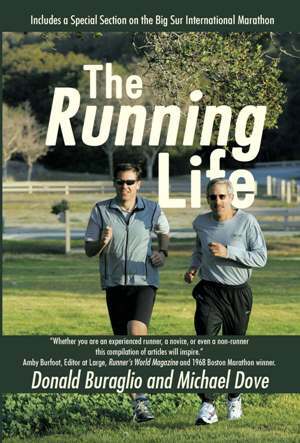 Purchase The Running LIfe Book!